The writer Andre Dubus (House of Sand and Fog) has described writing as inching your way along a very dark, very long tunnel: you can make out the next few feet in front of you, but you’re not quite certain where you’ll end up or when you’ll get there. What helps with the uncertainty and enormity of the task is to start with some kind of process to guide the way. Process is one of those things that in many parts of life I consider hopelessly boring and mind-numbing. Like alphabetizing canned goods. Or peeling beets. But in writing, process is necessary, because you need a kind of road map to get you to where you need to be. So here’s an infographic based on the 12-step writing GPS I outline in more detail in Everybody Writes. This GPS gets you from one place to another: from discombobulated thoughts to a coherent, cogent piece of writing that others can grok (and maybe love). My friends at Visual.ly created this for me—or, I suppose, they created it for you (technically). If you don’t know it, Visual.ly is like a Netflix for creative services: Its designers, journalists, writers, editors, animators and developers collaborate virtually with you to create the awesome, on demand. Feel free to print, download, embed, chew on, wrap yourself in, or otherwise use this infographic—in whatever way you’d find most useful. Want to embed this infographic on your own site or blog? Awesome infographic. I particularly like the idea of writing to one person. It really helps you speak to your target audience, and like you said, helps make your writing more personal (you vs. them/they). Tweeting this post out RIGHT NOW! Thank you, Dominique. Great to connect with you here and on Twitter. OK. Easy on the beets. If you boil them for an hour an a half they peel themselves. Love your writing tho! I love this so much I posted it on my own website 🙂 Thanks for taking the time to craft such a thoughtful, concise summary of content marketing. Gives me a great, visually-pleasing, easy way to help clients understand what I’m actually doing for them! Ann – Thanks for sharing the infographic. So many times I get passionate about a blog post but find out later that it could have been so much better if I produced TUFD and then walked away…even if just for ten minutes or so…before returning and re-reading, editing and coming up with an even better post. Great post – really like the idea of writing to one person. Great roadmap! I was laughing at Points 6 – 8, because earlier today I just posted, “Write drunk. Edit sober.” – Ernest Hemingway. While that’s another perspective of describing these points, it’s also a bit like group brainstorming, to get everyone’s ideas down without shunning them, then come back later to create links and prioritize. Super – so glad to have reconnected with your savvy, Ann. The new book looks like a must have – just ordered it. Thanks for the framework. Your words and the infographic make it all clear. The data and examples is a crucial. Can’t tell you how many times I’ve stumbled upon otherwise great infographics with really low quality resources. Huge waste of everyone’s time to create sub-par content. Great article indeed! It’s interesting to see how we all have our own ways to go about creating content for an article. I often walk away too. Ideas need fresh air 🙂 Thanks Ann for your words of wisdom! Very nice infographic! Numbers 6 and 7 are really important. I learned this from a prolific TV writer, who said “just write something. You’re going to change it anyway”. But good idea to walk away from it and come back with a fresh perspective. thank you for your great offer and content. I is very helpful for me to get more focussed on what I want and how to do it! The order of the steps is just great to follow exactly how it is described. Love this, as was missing this process and now have it stuck on my wall a foot in front of my face. One question as it relates to longer form content. Do you recommend ever having peers review the content prior to a final draft being created for feedback outside of the grammar and spelling corrections you mentioned? Always wonder if the content is too long, or certain parts are not as interesting to others as they are to me, in which case a little ‘market research’ might help. Or in your experience, will soliciting outsider perspectives put too many cooks in the kitchen, where it might be better to just trust your own instincts and push it live for your readers to decide? Hi, I’ve been reading your book and so far I been liking it a lot. But I have a question related to this infographic and I was hoping you could reply to it. Do you ask the, “so what?” question when you’re doing your first ugly draft? Or, you simply put all your thoughts in paper (well, probably on computer) and in your second review you start asking line by line and editing stuff. 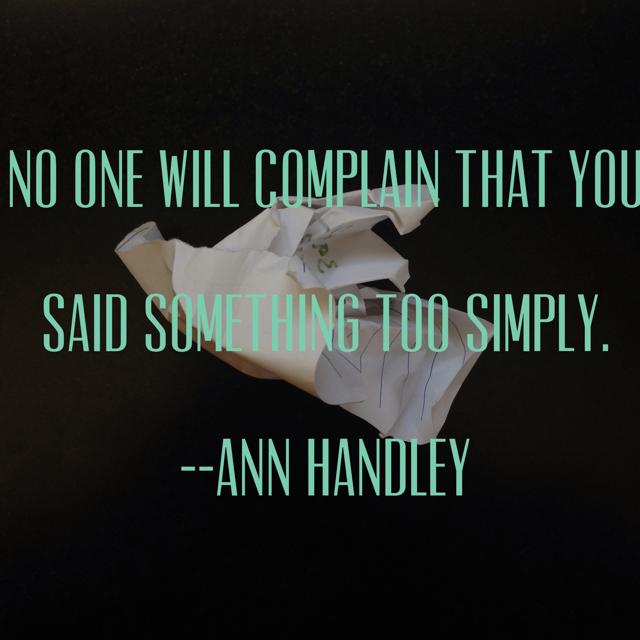 Thanks Ann Handley. I realize I’m one year late to comment, but I love the infographic! It really sums it all up so well. I’ve read your book and I highly recommend it to everybody (I even wrote a blog post on the topic http://www.olgatsubiks.com/#!How-to-develop-effective-writing-and-public-speaking-skills/rxo20/56f1f0d00cf213d90db37652). Thank you so much for what you do. Fantastic infographic. Exactly what I was looking for. Creating great content isn’t really hard as long as we really know in-depth details about the specific topic we are going to write. Thank You for this great Infographic. I love the ideas you have shared here. Thank you so much for this epic infographic.